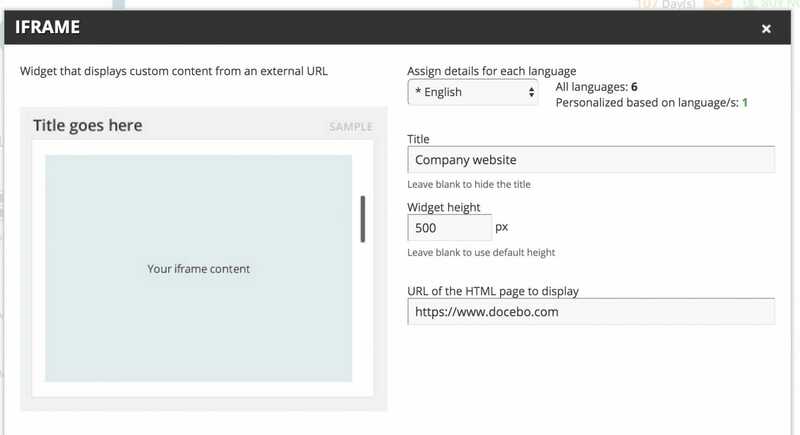 Docebo’s “My Dashboard” function allows you to create customized dashboards for you users to see upon logging into the platform, in turn allowing you to provide them information in a quick and simple way. Dashboards serve as a type of Welcome page, including all of the information and modules that you want your users to access quickly. You can create as many dashboards as you want, and assign specific dashboards to each kind of user you manage in the platform. For example, you can customize a dashboard based on your organizational chart nodes by building and assigning a different welcome page for each branch. 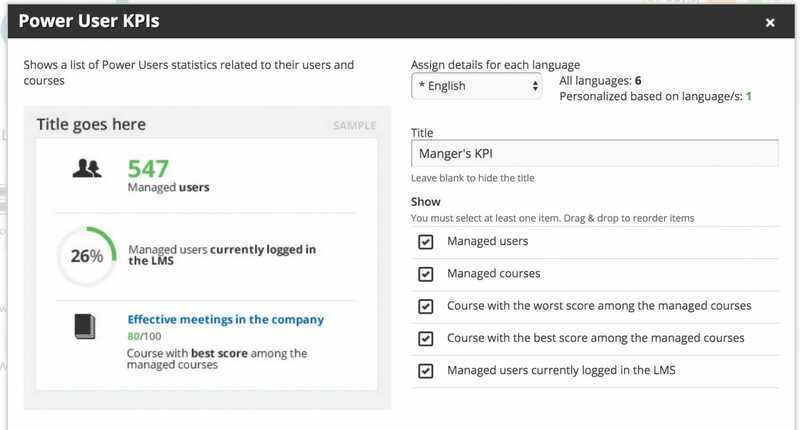 You can also create dashboards based on the user’s level. 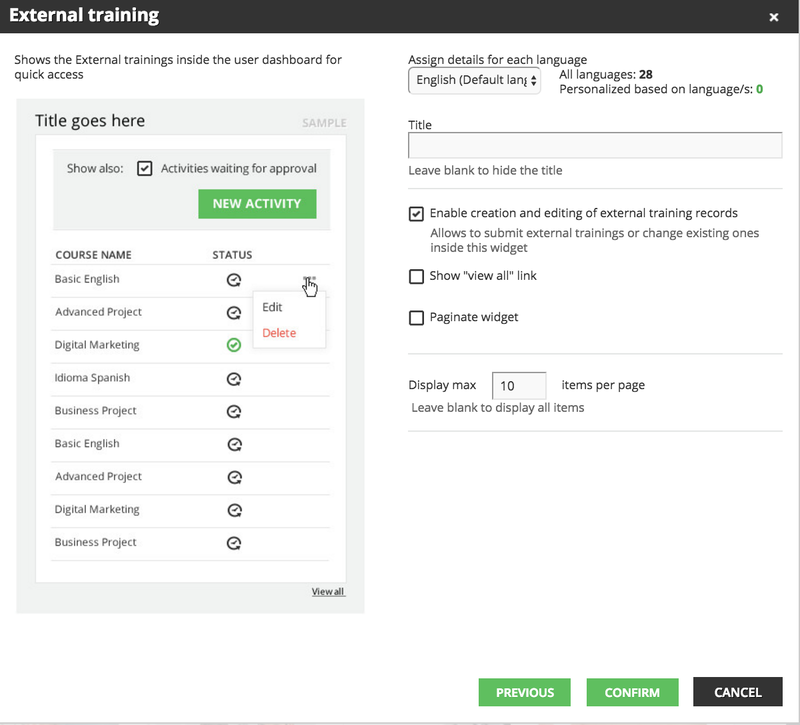 For example, creating one dashboard for the Superadmin, one for the power users, and one for the learners. Each dashboard will display different information as per your needs. This feature is only available for Docebo version 6.6 or higher. Only Superadmins are allowed to create and customize dashboards. Log into the system as the Superadmin, select the gears icon from the left sidebar to access the Admin Menu, then press the Dashboard Layout subitem from the Settingssection in the first column. 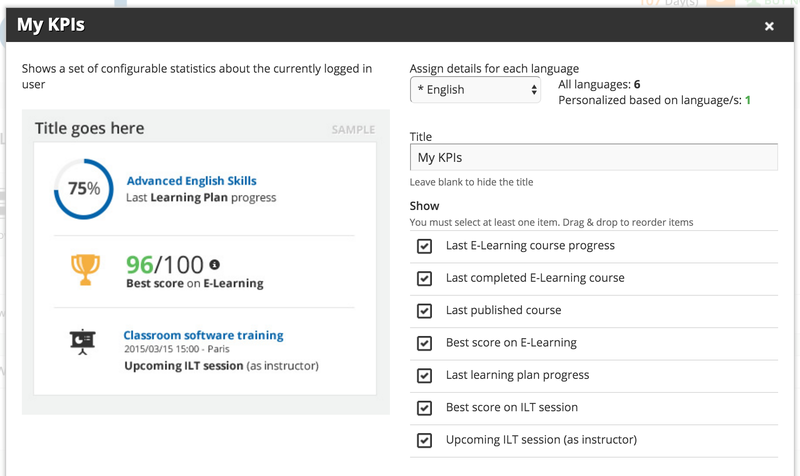 The platform’s default dashboard configuration is called the Standard Layout, in which you will find only the My Courses area. You can apply this widget to all of the users that have no other dashboards assigned to them by simply clicking the black flag. When the flag turns green, it means that all of the users will see this dashboard as their main page in the platform. You can edit the standard layout by adding new widgets or adding other dashboards. To create a new dashboard select the New Widgets Layout button in the action bar at the top of the page, then assign a name to the new dashboard and press Save Changes in the pop up box. Now, find the dashboard in the list of dashboards. Press the widgets icon in the dashboard’s row to add the widgets to your dashboard. Begin by adding a row into this dashboard by pressing the New Row button in the action bar at the top of the page. Then, move to the Select Row Layout section for the new row, and pick how many columns and which layout you want for that specific row. Now, press the plus icon inside the rectangle in order to choose which widget you would like to insert. Select the widget from the widgets menu then press NEXT. Now, you need to fill out the settings page for the widget. Please Note: The settings page will differ from widget to widget. Once you have inserted all of the widgets and configured the settings for each widget, you can check the final outcome by clicking on the Preview button in the action bar at the top of the page, or you can add another row to the dashboard, thus adding more widgets. You can insert as many rows as you want. 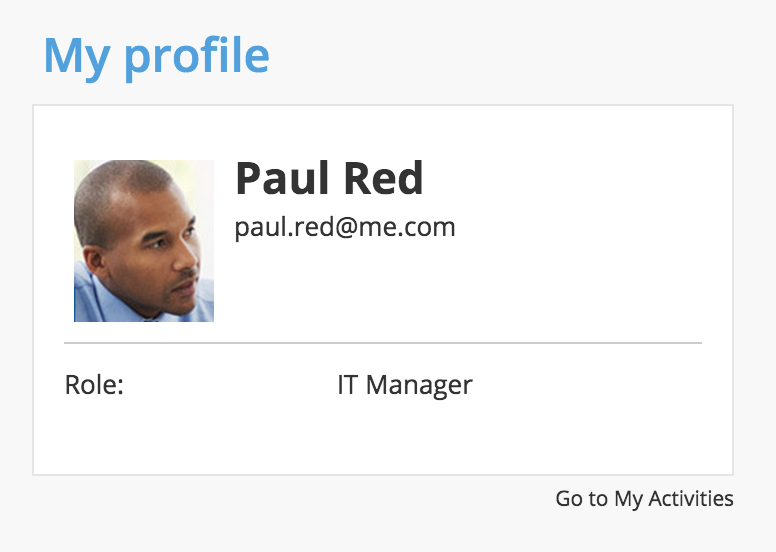 Once you are finished, you can assign the new dashboard to specific users. In order to assign a dashboard to a specific group or folder (or multiple groups or folders), select the FILTER link that corresponds to the dashboard’s row in the list of dashboards (as shown in the picture below). Now you can choose the users who will see this dashboard as their main page in the platform. Remember, you can create a specific dashboard for a specific branch of your organizational chart, then assign the dashboard to that specific branch. You can also create a specific dashboard for a particular target group by choosing from Users, Power users or Superadmins. For example, you can create a specific dashboard for a company manager, and another one for the power users of the company. Please remember that if you assign a dashboard to Power Users, then you must also choose the Power Users’ profile that will be able to see the items selected in the new dashboard. 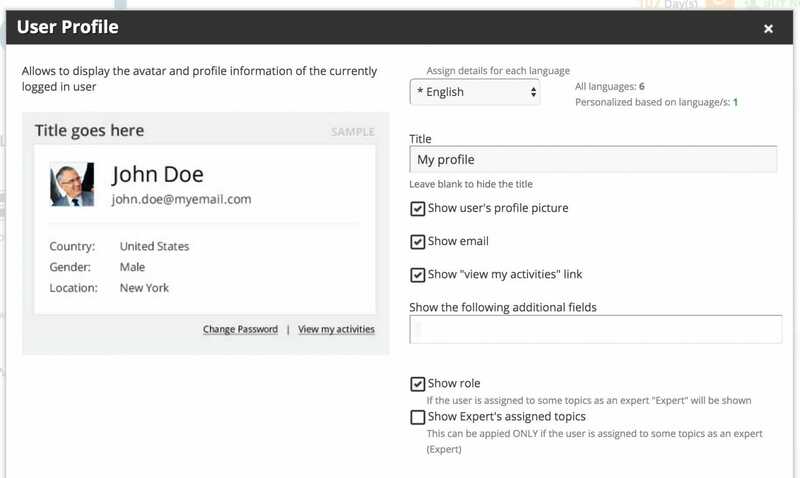 Select the POWER USER PROFILE link related to the dashboard (as shown in the picture below), and choose if you want to apply the item to all Power Users or to just a specific Power User profile. You can also choose to apply a standard dashboard to all other users whom you don’t want to associate with the new dashboard. To do this, click on the flag related to the dashboard that you want to delegate as the default main page for these users. This widget displays custom content from an external URL. You can simply copy and paste the link of the website that you want to show in the Dashboard. Insert the title of the widget, the height, and the link of the page that you want to display. To hide the title, leave the ‘Title’ box empty. If you do not insert a value in the widget height box, the system will use the default height for this kind of widget. Select theCONFIRM button to complete the operation. Insert the title, then choose which social networks you want to display. Select the CONFIRM button to complete the process. Once you have inserted the names of the social networks, you will also be able to insert the links to the social media webpages, as well as the text that will appear when someone hovers over on the related icon. The “My activities” link. By selecting this link, users will be redirected to the user’s personal summary page. Please Note: If you have previously created additional fields in the users’ area, you can insert them in the widget just by adding the names of the fields in the related box. Select the CONFIRM button to complete the operation. 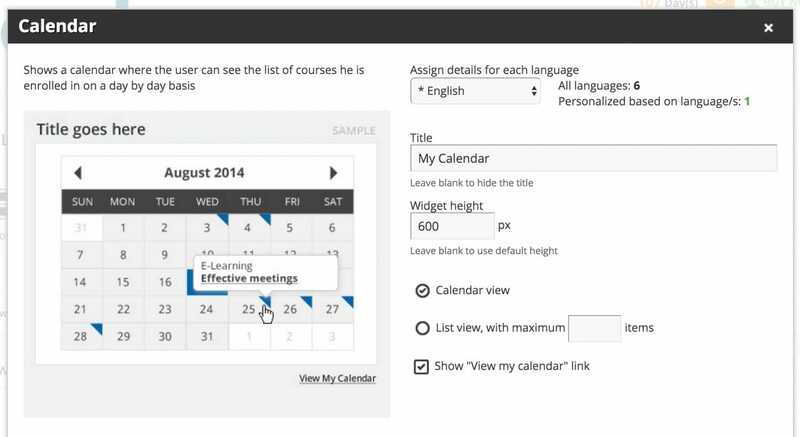 This widget displays a calendar that shows all of the courses in which a user is enrolled on a day-to-day basis. Insert the title of the widget. You can choose how to display the information: either as calendar view or as list view. If you select the list view option, you can also decide how many items you want to show in the list. Select the CONFIRM button to complete the operation. Check the final outcome. Here, you can see the difference between calendar view and list view. This widget displays a set of configurable statistics about a user that is currently logged into the platform. Insert the title of the widget, then select which items you want to include in the widget by flagging the check box next to the item. You can also change the order of the items; just click the icon on the right, and drag and drop the elements. This widget lists all of the courses and learning plans in which the user is enrolled. Insert the title of the widget, then choose if you want to show the courses as a list or as thumbnails. Please remember that ‘thumbnail view’ is only available if you insert this widget in a “one column” or “two columns” layout. You can also choose if you want the users to see the search bar and the switch button, which allows users to change the courses’ view modality. 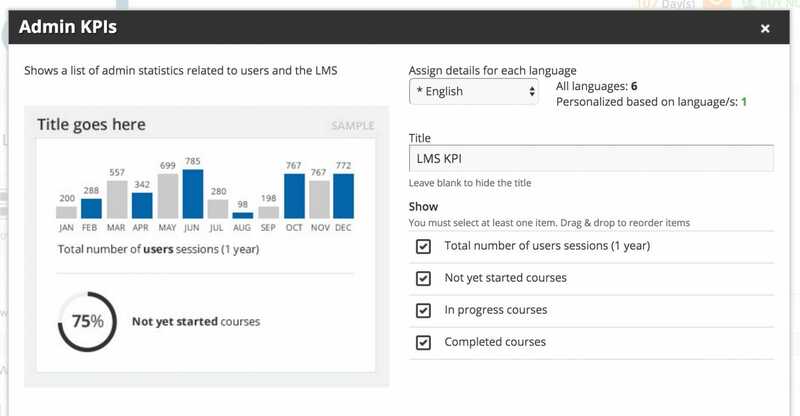 You can also define how many courses you want to show in the widget and in the full list; users can access the full list by clicking on the View all courses link. 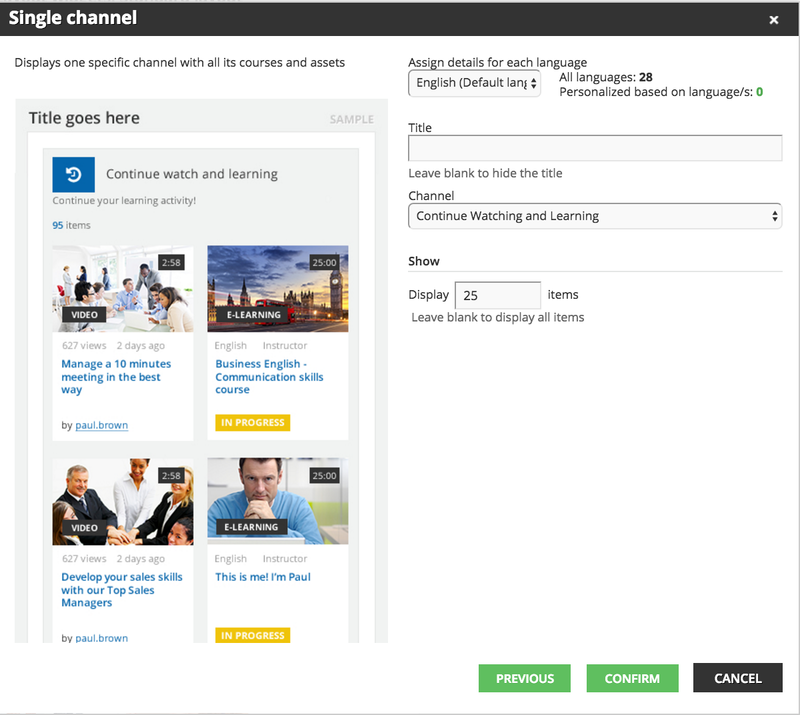 Not display the courses that are included in a learning plan. Please note that if you do not insert the ‘Courses’ widget in the users’ dashboard, they will not be able to see their courses upon logging into the platform. 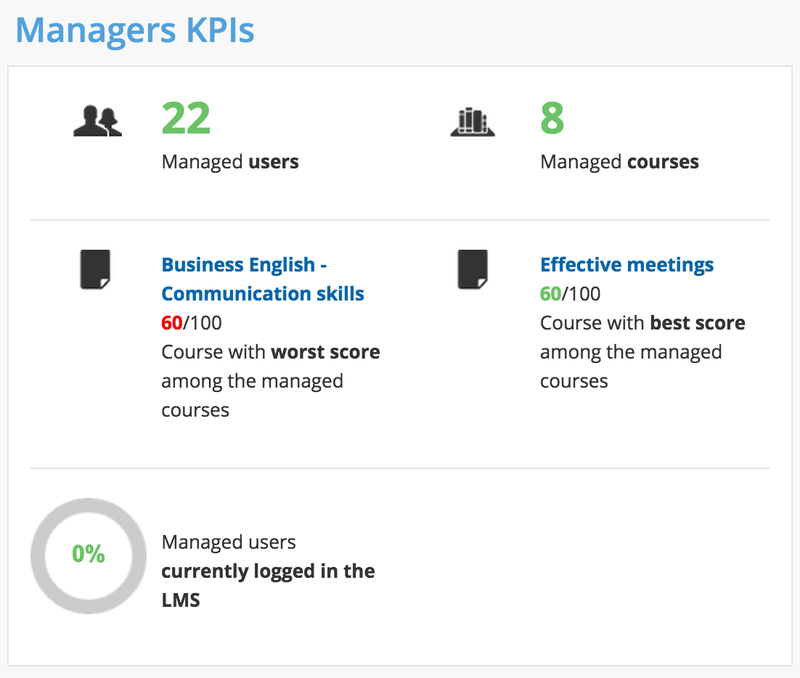 This widget displays a list of admin statistics related to users and the LMS. We suggest including this widget only in the Supereadmins’ dashboards. Insert the title of the widget, then select which items you want to include in the widget. You can also change the order of the items; just click the icon on the right, and drag and drop the elements. 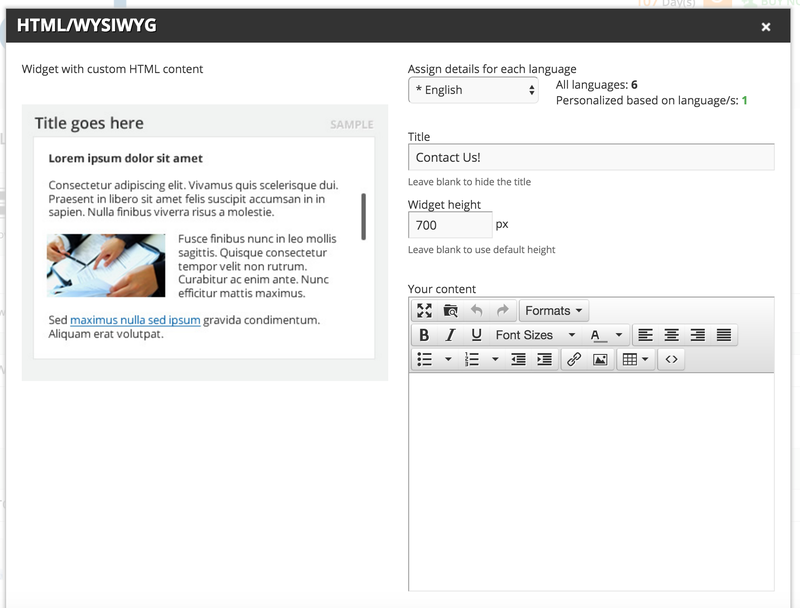 This widget allows you to create custom HTML content. Insert the title of the widget and its height. If you do not insert a value in the widget height box, the system will use the default height for this kind of widget. 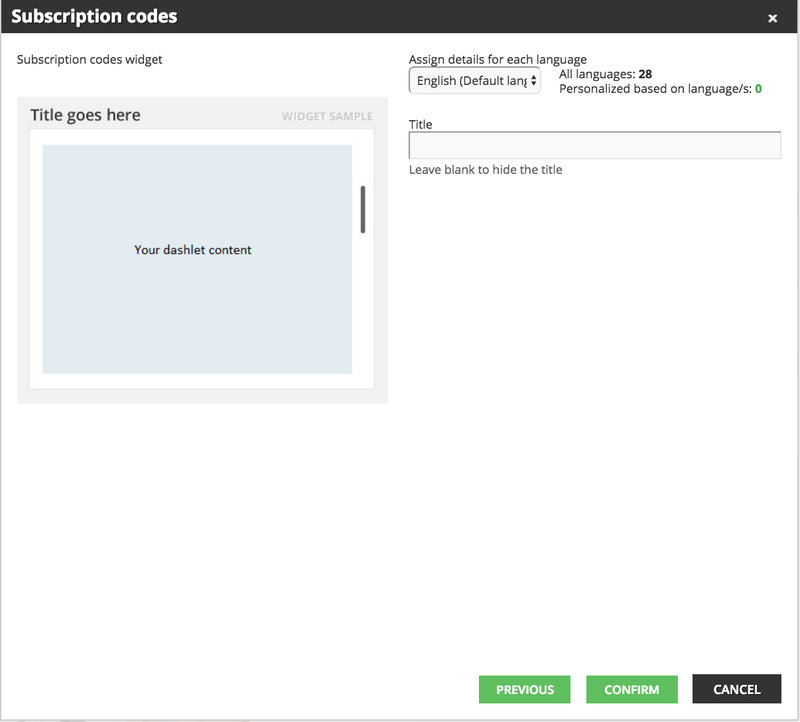 Use the text editor to add text and pictures, or to embed videos from YouTube or Vimeo. This widget displays a list of available courses for the user to buy or subcribe. Insert the title of the widget. Similar to the Courses widget, you can choose if you want to show the courses as a list or as thumbnails. Please remember that the ‘thumbnail view’ is only available if you insert this widget in a “one column” or “two columns” layout. 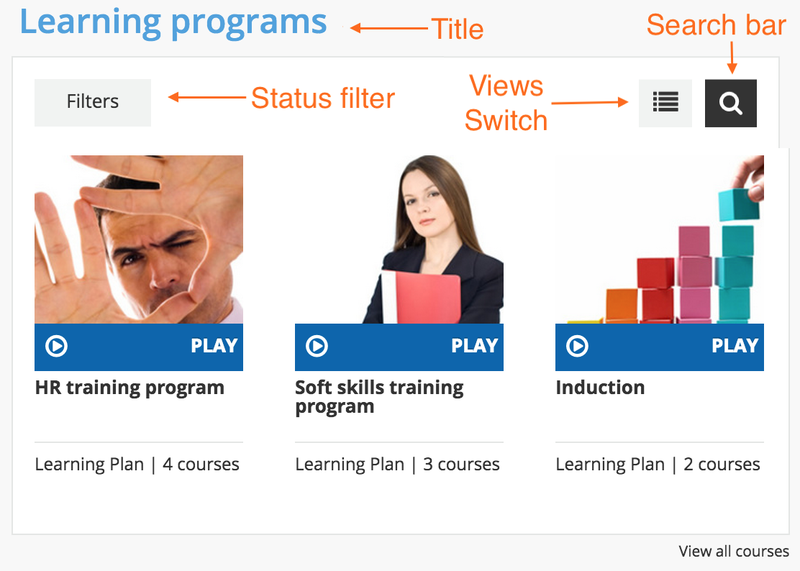 You can choose if you want your users to see the Filter selector, which allows users to display only the active courses, the completed courses, or all courses. You can also choose if you want them to see the search bar and the switch button; the switch button allows users to change the courses’ view modality. You can also define in how many courses you want to show the catalog widget, or select all of the catalogs. 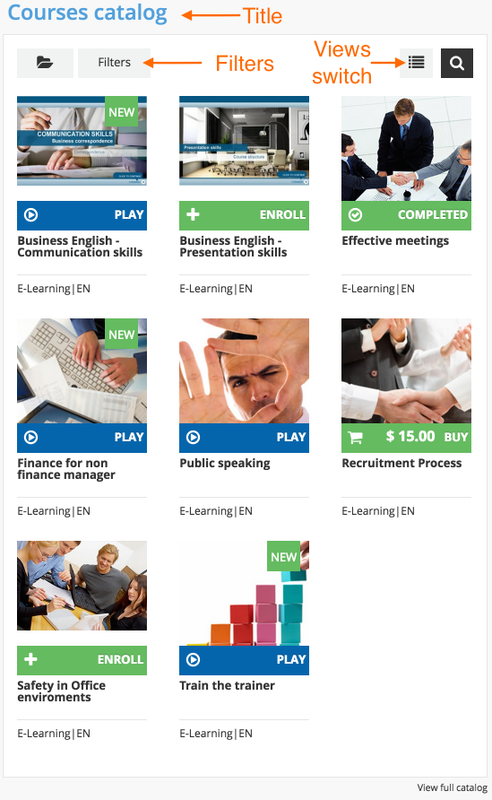 Users can access the full list by clicking on the View all courses link. 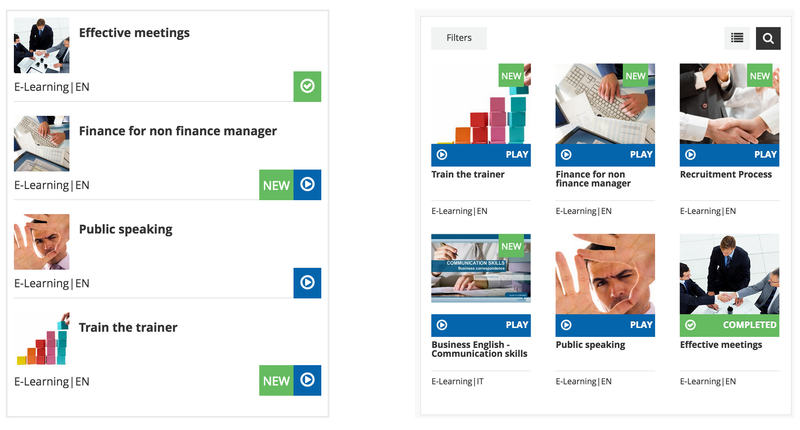 You can also decide if you want to paginate the dashboard or show the link View all courses. 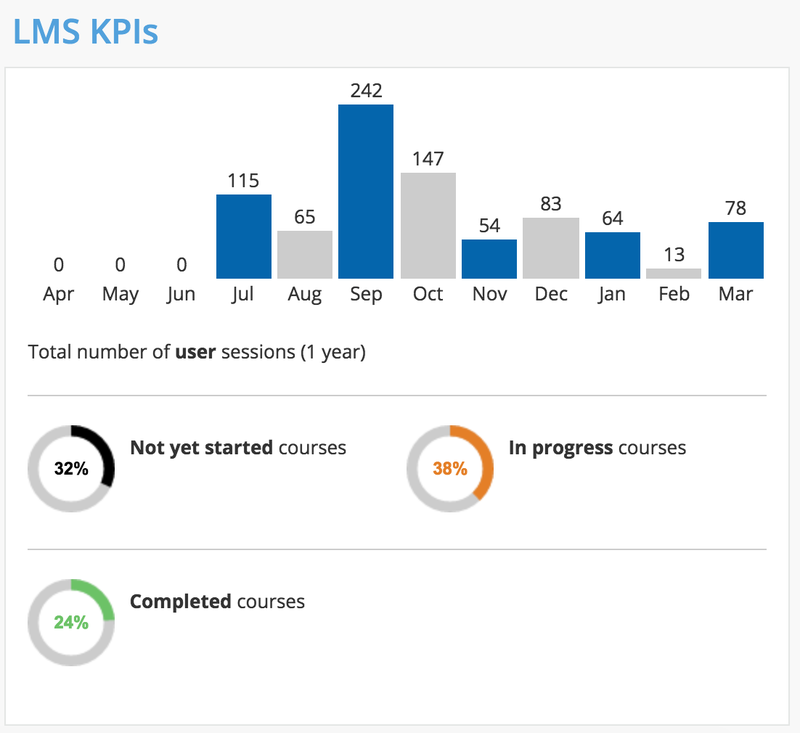 This widget displays a list of Power User statistics related to their users and courses. We suggest including this Widget only for the Power Users’ dashboards. Select which items you want to include in the widget. You can also change the order of the items; just click the icon on the right, and drag and drop the elements. 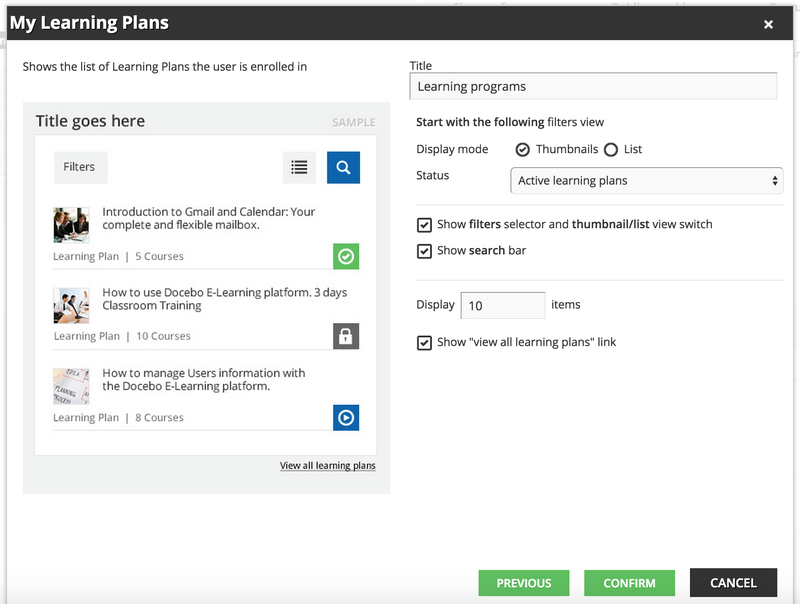 This widget displays the list of Learning Plans in which the user has enrolled; each user will view only their own Learning Plans. 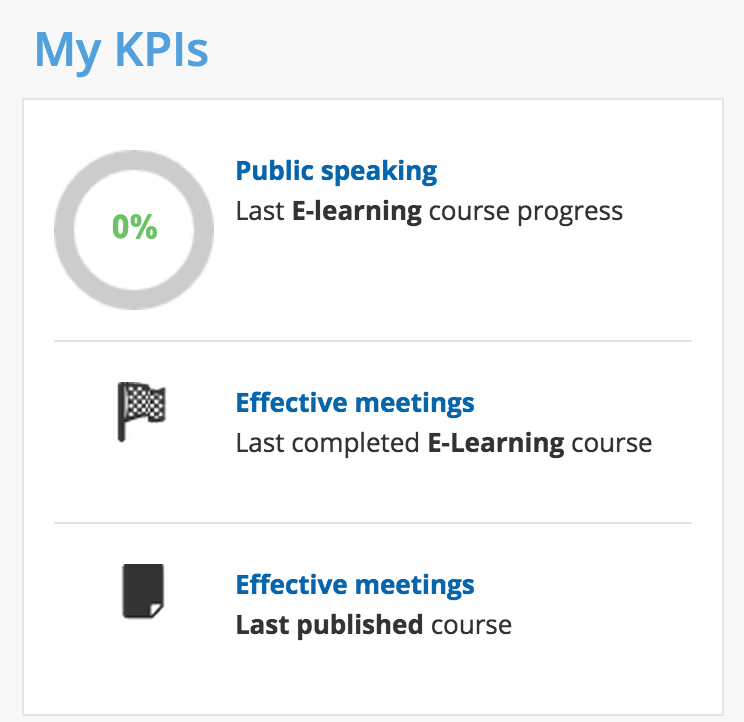 Similar to the Courses widget, you can choose if you want to show the learning plan as a list or as thumbnails. Please remember that the ‘thumbnail view’ is only available if you insert this widget in a “one column” or “two columns” layout. You can choose if you want your users to see the categories filter and the search bar. 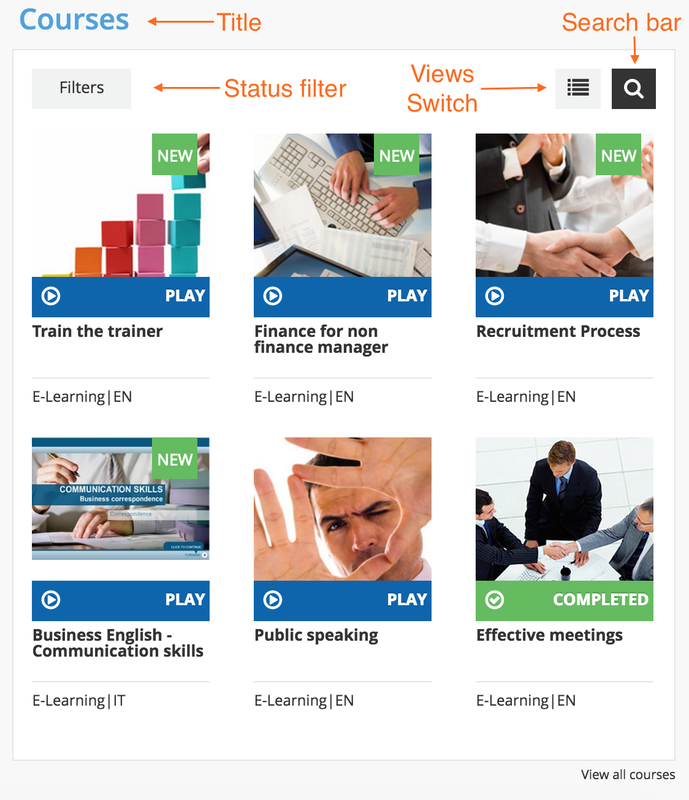 You can also choose if you want users to see the switch button, which allows them to change the courses’ view modality. 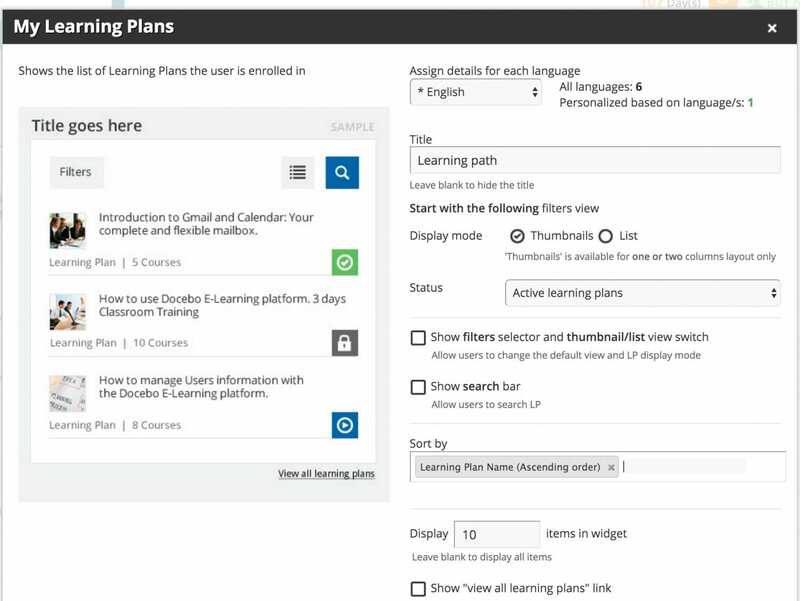 You can also allow users to filter Learning Plans by status. This widget allows you to display the users’ blogs. You can decide if the user will only have access to his or her blog or if the user can view another blog, which you specify; these blogs will be visible to all the others users as well. It is also possible to include the post’s author and date of publication. This widget is for those using Docebo’s Subscription Code app. This widget makes subscription codes easily accessible for users. Simply insert the title of the widget, the pressConfirm. This widget is only available if you are using Docebo’s Gamification App. Here, you display user badges, contests, and the leaderboard. Begin by giving the widget a title, then flag what information you want to display in the widget. When finished, press Confirm. This widget is available for those that have enabled the Rewards Marketplace for the Gamification App. Start by adding a title to the widget, then choose how many items you want to display in the corresponding text box. 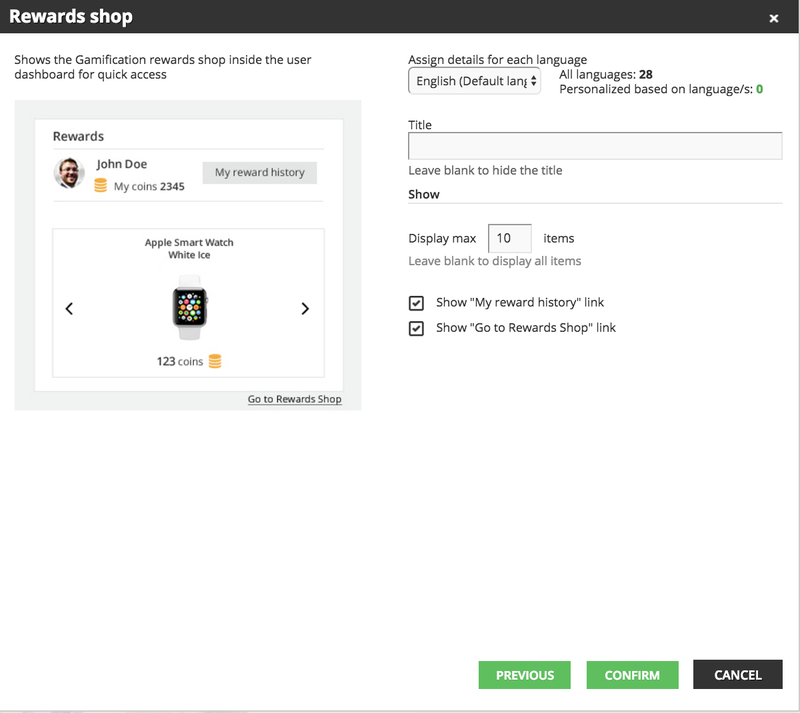 Finally, flag whether you want to show links for the user’s rewards history and a link to go to the Rewards Shop. Press Confirm when you’re finished. 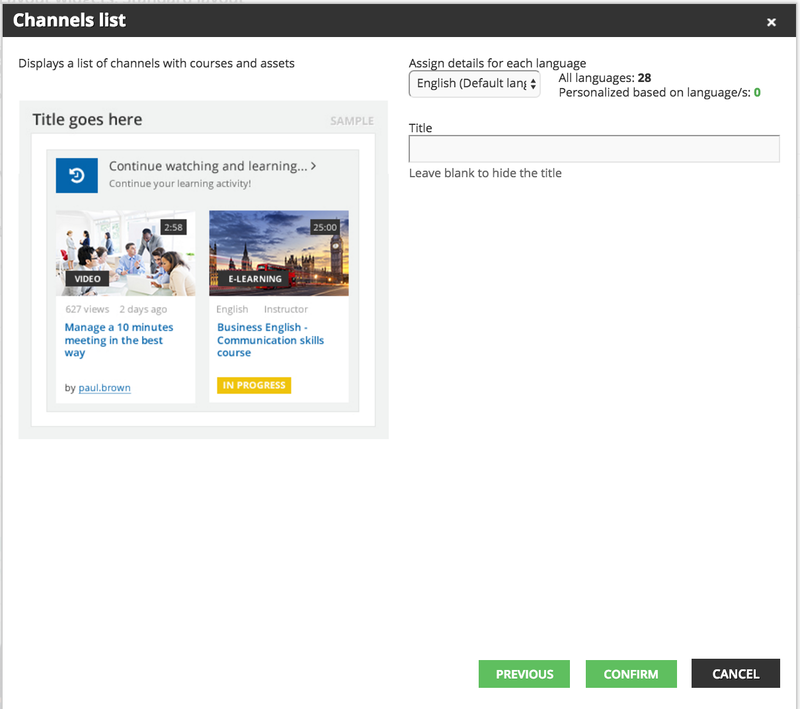 This widget displays a list of channels and assets within the channels for those using Docebo’s Coach and Share Module. For this widget, you just need to add a title as desired, then press Confirm. This widget displays a single channel with assets for those using Docebo’s Coach and Share Module. Add a title to the widget, then select which channel you would like to display from the corresponding drop down menu. Finally, decide how many items you want to display and type the number into the text box. When you’re finished, press Confirm. 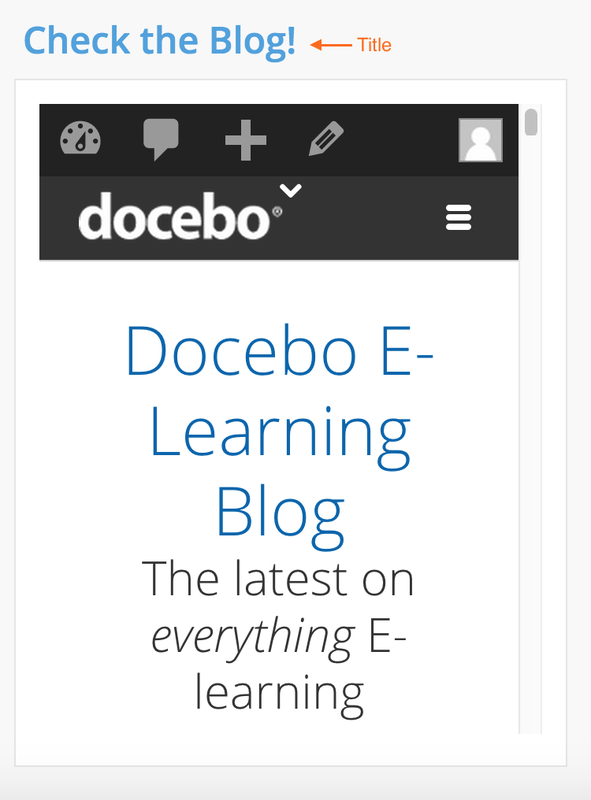 This widget provides quick access for users to Docebo’s External Training App, allowing them to view and manage their external training activity. Finally, use the corresponding text box to decide the maximum number of items displayed inside the widget. When finished, press Confirm.